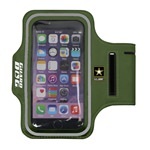 Officially Licensed US Army Sport Armbands from Guard Dog are great for on-the-go use! Each armband is adjustable and made from sweat-resistant material. Each Sport Armband has a key holder pocket, two headphone jack openings, and is compatible with phones up to 5”.